We stock a wide range of quality plastic glue, polish and applicators. Brands you can purchase from our store include ACRI-BOND, Zettex Spraybond, Acrifix and Quixx. These products are easy to use with an array of plastics. 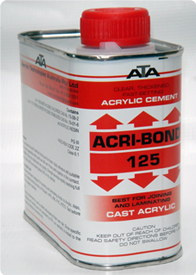 ACRI-BOND is an Australian made range of quality solvent adhesives. 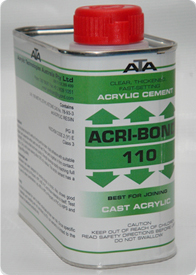 Each of these ACRI-BOND glues are clear and quick setting. In addition, they are easy to use, so you can apply them in a number of ways. Ways in which you can apply these products include using a needle or syringe, as well as brushing it on. You can purchase these items in 100ml, 500ml and 4 litre bottles. In addition, colours can be added to each of these clear glues if you need a custom made plastic glue. Custom coloured glues are ideal for use when teaching students or trainees due to their increased clarity. Therefore, when you add colours to clear glues, it helps you to show students how the glue works. 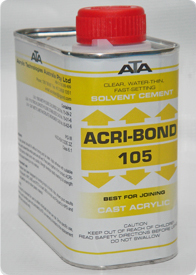 ACRI-BOND 105 is a water thin, clear solvent cement designed for bonding cast Acrylic. This product has a very fast curing time, and is great for use with many plastics. These plastics include ABS, HIPS, PC, and PETG. Yielding instant bonding, this glue is perfect for making T-Bonds and bonding of narrow spaces. Please see chart below for suited plastic uses. Test before use for other mixes. Parts to be joined should be clean, and fit without forcing. Apply adhesive with applicator and assemble while parts are still wet. Firmly press parts together ensuring full contact. ACRI-BOND 120 forms initial bond very quickly, with strength developing rapidly. Full strength is reached in 24-48 hours, leaving no dry residue. This plastic adhesive leaves a clear finish on all materials and provides very strong bonding. It is fast drying and the initial bond is firm within a short time. After drying it leaves approximately 30% solid residue. Suitable plastic combinations as shown on chart below. Test before use for other combinations. Parts to be joined should be clean, and fit without forcing. Apply adhesive with applicator and assemble while parts are still wet. Firmly press parts together ensuring full contact. ACRI-BOND 120 forms initial bond very quickly, with strength developing rapidly. Full strength is reached in 24-48 hours, leaving approx 30% dry residue. This acrylic cement has a limited gap-filling ability. 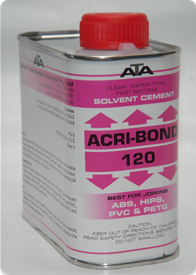 ACRI-BOND 120 plastic adhesive is a very fast curing, water thin, clear solvent cement. Suitable for joining ABS, HIPS, PVC and PETG. This easy to use adhesive provides instant initial bonding. Leaving a clear finish, this is an ideal glue for model makers as well as sign fabricators. Suitable plastic combinations as shown on chart below. Test before use for other combinations. Ensure parts to be joined are clean, and fit without forcing. Apply adhesive with applicator and assemble while parts are still wet. Firmly press parts together ensuring full contact. ACRI-BOND 120 forms initial bond very quickly, with strength developing rapidly. Full strength is reached in 24-48 hours, leaving no dry residue. This product provides very strong bonding, leaving a clear finish. Suitable plastic combinations as shown on chart below. Test before use for other combinations. The surfaces you are joining should be clean, and fit without having to force them together. Apply the adhesive with your applicator, assembling while the parts are still wet. Firmly press the parts together, ensuring they make full contact. ACRI-BOND 120 forms initial bond very quickly, with strength developing rapidly. Full strength is reached in 24-48 hours, leaving approx 20% dry residue. 100ml – 400ml sizes are available on eBay, or contact us to make an enquiry or purchase larger quantities. This product contains fine abrasive particles. The surface of the plastic is lightly dissolved by these particles while subsequently polishing it. As you polish, the edges of the scratches are rounded off. In addition, as you are polishing, the bottom of the fissure will automatically be filled in. As a result, this returns the surface to its former smoothness and clarity. Using a soft, clean cotton cloth or pad, polish the scratched areas. Be sure to apply heavy pressure for 2-3 minutes. For deep scratches repeat the application several times. Remove the residue with another soft, clean cloth. Very deep scratches require treatment before polishing. All you need is the abrasive paper supplied with your product, as well as bit of water. Firstly, apply a small amount of water to the surface. Secondly, gently rub the surface with the provided abrasive paper. Finally, remove the residue and clean the surface with water. Once you have pre-treated your surface, you then polish your prepared surface with Quixx. Do not use on any printed, varnished or coated surfaces. Not suitable for use on Polycarbonate (PC). Firstly, make sure you remove any moisture and grease from the surface you are adhering. Ensure the surface is contaminant free. So, now that the surface is clean and dry, you are ready to begin the application. Shake the can before use, and adjust the nozzle to give the required spray pattern. Hold the spray can approximately 30cm away from the surface. Spray one surface horizontally and the other surface vertically. Make sure you are applying a single, even layer to each surface. Doing so will allow a a smooth and even application. Allow the adhesive to become touch dry, which usually takes 2-4 minutes. Finally, press each surface firmly together. Begin at the centre, working outwards to achieve a good contact and exclude any air bubbles. Adjustable spray nozzle. You can turn the fan horizontally or vertically. In addition to this, you can also completely tilt the nozzle forward and backward. This highly adjustable nozzle enables you to use precise control. Instant bond . Sprayed surfaces can be bonded instantly in as little as 2 minutes. This is a very strong bonding UV adhesive, designed for use with perspex. This great product cures to a clear and bubble-free finish when you expose it to UV light.